Erik Sass is covering the events of the war exactly 100 years after they happened. This is the 287th installment in the series. September 1917 saw the chaos in revolutionary Russia reach a fever pitch, as a major new German offensive on the Baltic coast triggered yet another unsuccessful coup attempt against the beleaguered Provisional Government, which had just fended off a far-left uprising instigated by the Bolsheviks in July. This time it was a rightwing military revolt led by the recently appointed commander-in-chief General Lavr Kornilov (although Kornilov claimed it was actually intended to strengthen the Provisional Government against the rival Petrograd Soviet). The end result was to further discredit and destabilize the Provisional Government, now facing open opposition on both the left and right, setting the stage for the Bolsheviks’ final successful coup attempt in November 1917. Kornilov was spurred to action in part by the German capture of Riga (now the capital of Latvia) on the Baltic coast – a major blow that brought the Germans closer to the Russian capital of Petrograd and threatened the breakup of the northern sector of the Eastern Front. An advance here would also shorten the frontline, freeing up German forces needed to fend off the British assault at Passchendaele on the Western Front. The German Riga offensive wasn’t a walkover: while indiscipline and rock-bottom morale prevailed throughout the Russian Army, ordinary Russian soldiers were still willing to stand and fight in defense of their homeland, at least for now. However German superiority in morale – not to mention heavy artillery, aerial reconnaissance, and logistics – left little doubt about the final outcome. The attack began on September 1, 1917 with a sudden, punishing bombardment by the artillery of the German Eighth Army, targeting the defensive positions of the Russian Twelfth Army behind the River (Daugava). As the shelling reached its climax German pioneers moved up with pontoon bridges and boats to ferry the assault force across the broad, fast-flowing river, in another testament to German engineering and tactical skill. As it became brighter I was able to see the water of the Düna, which was flowing quite quickly here. The Russian position on the opposite bank was not yet visible as white fog prevented us from seeing further. We were all tense about what was about to happen. All at once, the German artillery, which had been concentrated here, started to fire. The shells whizzed over us and exploded on the other side of the river with a booming din. A number of mortars, mainly heavy ones that shoot two hundred-weight shells, joined the dance. There was such a crashing, whizzing and roaring that my ears started to hurt. As the sun rose, the fog gradually disappeared and I was able to see the Russian position on the opposite bank. It was completely shrouded in black smoke, constantly and everywhere there were abrupt flashes and enormous clouds of smoke shot into the sky… Then the Russian artillery started to fire, so that we were forced to duck down in the trench. In the middle of this din came the order: ‘Get ready!’ We looked at each other. ‘We can’t possibly swim the river!’ said some of my neighbours. Then behind us we heard a yelling as if horses were being driven forward. I looked back and saw that the bridge train was arriving. They rapidly drove the waggons, which were laden with metal boats… down to the river. A large number of sappers came up at the double behind them and in no time at all the boats were unloaded and in the water. It was very frightening on the water. We all ducked down into the boats. The shells whoosed overhead while under and around us the water gurgled. Wherever I looked the whole river was seething with boats which were heading as quickly as possible to the opposite bank. Russian shells landed between the boats in the river throwing huge columns of water into the air. Another boat upstream from our suffered a direct hit and sank in a few seconds. The occupants who had not been wounded fought with the waves for a short time and then all disappeared. It sent shivers up my spine. Now we had to storm the Russian trenches. That was an easy task. We did not encounter any resistance at all. The trench had largely been flattened. Mutilated corpses of the Russian infantrymen were lying around. Every so often you would encounter an unscathed Russian sitting in the corner of a trench and he would raise his arms in the air when we appeared, in order to surrender. 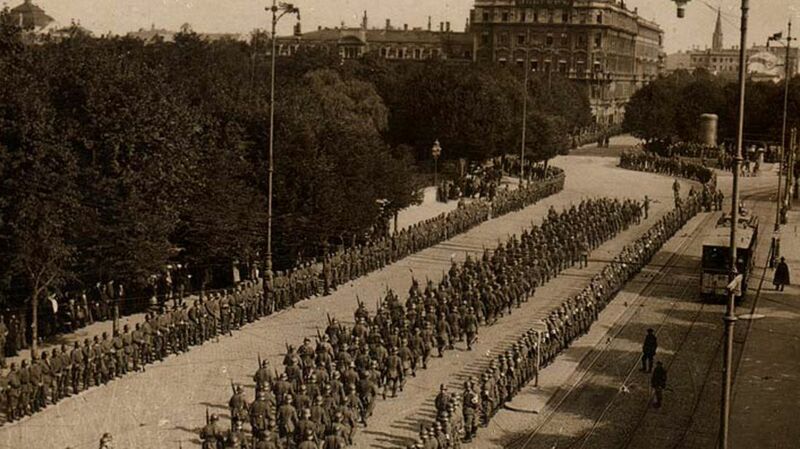 Over the next few days the German offensive pushed forward from these bridgeheads over the Düna to the east of Riga, threatening to encircle the Russian Twelfth Army. 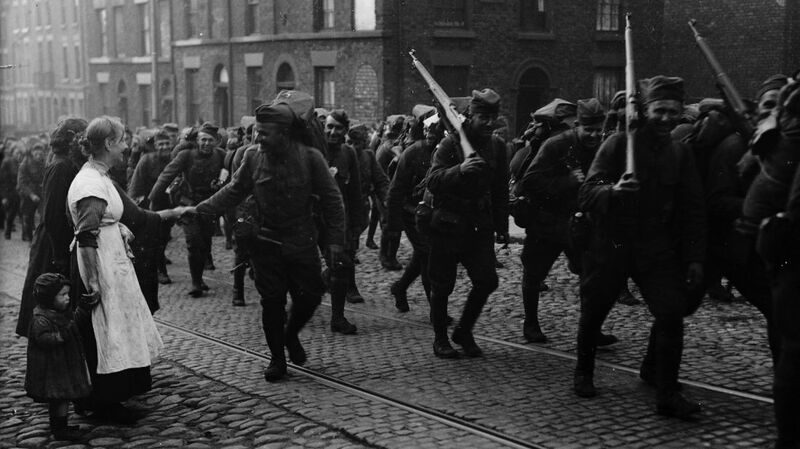 However a fierce holding action, fought in large part by Latvian riflemen, held up the German attackers long enough for the Twelfth Army to retreat towards Petrograd, still mostly intact. Isn’t the Russian news fierce? I’ve never seen anything like the way it has taken the punch out of every one. I was down at the Gare du Nord yesterday doing a little work for the Red Cross, distributing cigarettes, etc., among the outgoing French soldiers. We couldn’t seem to cheer them, and I didn’t see any of the usual smiles. The ray of light which the U.S. troops brought when they began coming over has, for the moment, been completely obliterated. The papers don’t deny that it is the worst blow the Allies have received since the war began, and it is as though a black cloud has descended upon every one. Of course the effect on Russian morale was even more pronounced. After the disastrous outcome of the Kerensky Offensive, the loss of Riga seemed to show that the Russian Army was essentially unable to defend the homeland. Meanwhile conditions for ordinary soldiers had hardly improved, and in many cases worsened, since the February (March) Revolution. Finally the infamous Order No. 1, issued by the Petrograd Soviet in March 1917, which effectively abolished military rank and with it officers’ authority, encouraged mutiny and insubordination and resulted in a steady stream of dispirited officers resigning their commissions and going home. With disaster looming, the Provisional Government appeared irrelevant while the Petrograd Soviet seemed more concerned with “protecting the revolution” than fighting the external enemy. Against this backdrop one of the last bastions of conservatism in Russia mounted a final, desperate attempt to restore order – and failed spectacularly. For months rumors had been circulating of a military coup to replace the feeble Provisional Government and crush the growing power of the Petrograd Soviet. The flashpoint for the failed military revolt came when Prime Minister Alexander Kerensky asked Kornilov, recently appointed commander-in-chief, to move troops loyal to the Provisional Government from the front to Petrograd in order to shore up the government’s authority versus the Soviet, increasingly dominated by radical socialists including Lenin’s Bolsheviks (below, Kornilov). Kornilov, reasoning that such half-measures were no longer appropriate, instead led a large force of loyal troops in a march on Petrograd with the intention of purging the Provisional Government of radical elements, suppressing the Soviet, and calling a new Constituent Assembly, claiming that he was doing so at Kerensky’s invitation. However this action was far more extreme than Kerensky had envisioned, and the prime minister feared (probably with good reason) that Kornilov in fact meant to establish himself as a military dictator. Kornilov also earned the hatred of troops loyal to the Soviet with his support for the reinstatement of capital and corporal punishment within the Army. People of Russia. Our great Motherland is dying. Her end is near. Forced to speak openly, I, General Kornilov, declare that the Provisional Government, under pressure from the Bolshevik majority in the Soviets, is acting in complete accordance with the plans of the German General Staff and simultaneously with the landing of enemy troops near Riga, is killing the Army, and convulsing the country internally. The solemn certainty of the doom of our country drives me in these terrible times to call upon all Russians to save their dying native land… I, General Kornilov, son of a peasant Cossack, announce to all and everyone that I personally desire nothing save the preservation of our great Russia, and vow to lead the people, through victory over our enemies, to a Constituent Assembly, when they themselves will settle their fate and select the form of our new national life. I cannot betray Russia in the hands of her ancient enemy – the German race! – and make the Russian people German slaves… People of Russia, in your hands lies the life of your native land! Faced with this apparent attempt at counter-revolution, Kerensky took the extreme – and extremely unwise – measure of arming radical forces loyal to the Soviet, including the Bolsheviks, who had already been building their own paramilitary force in the form of the Red Guards. He also submitted to the Soviet’s demand that the government release leading socialists imprisoned after the unsuccessful Bolshevik coup attempt in July, including Trotsky. Kornilov and his associates were imprisoned by socialist troops loyal to the Soviet, and dozens of officers suspected of supporting the counter-revolution were arrested. Ever the opportunist, Kerensky then presented himself to the conservative elements of Russian society as the only force able to contain the looming Bolshevik menace. In the short term this move allowed Kerensky to make himself virtual dictator of Russia, while declaring the country a Republic as a fig leaf for this power grab – but in reality it spelled the end of his authority, as both left- and rightwing factions now distrusted him for what they viewed as serial betrayals. Bolshevik power was growing by leaps and bounds: by the end of September 1917 Lenin’s party had 400,000 members, up from 24,000 at the beginning of the year. As the Kornilov attempt to bring order has failed, I will tell you what I foresee now, for the cards are shuffled again. Kerenski is already in the hands of the Soviet. The Soviet now have virtually full power, and the Bolsheviki will become more daring and try to turn out the Government; then would come anarchy, with 70,000 workmen fully armed. With the Bolsheviki are all the criminal classes. The failure of Kornilov has completely knocked me over, yesterday I could not walk. I still foresee an ocean of blood before order comes.